Station astronaut Christina Koch will remain on board for about 11 months, until February — approaching but not quite breaking Scott Kelly’s 340-day U.S. record. 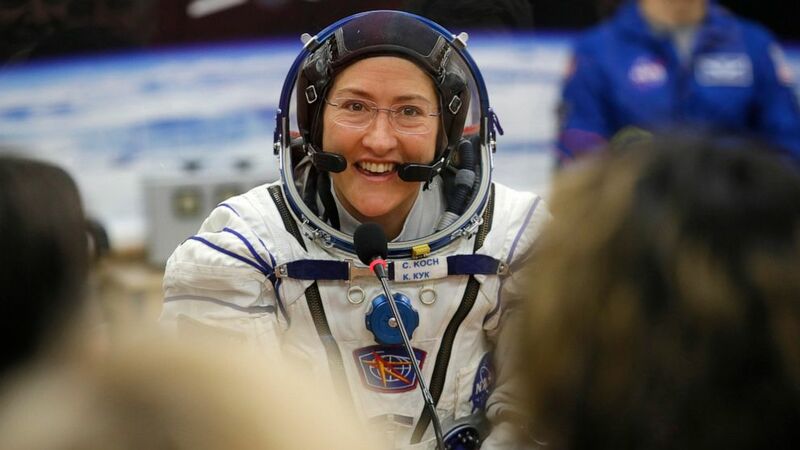 Koch will break Whitson’s 288-day record for the longest single spaceflight by a woman at the end of December. “I hope that me being up here and giving my best every day is a way for me to say thank you to people like her,” Koch said in a NASA interview broadcast Wednesday. Koch said before launching, she and her husband listened to an audio recording of Kelly’s 2017 autobiography, “Endurance.” She said there was a lot of helpful advice. An electrical engineer who’s worked in Antarctica, Koch will undergo medical tests during her stay. More subjects and more diversity are needed, she noted, to better understand the effects of long-term spaceflight as NASA aims to return astronauts to the moon within five years. “It’s almost turning into not that big of a deal to have somebody on board station for 10, 11 months because we’ve done it before, we’re good at it and we’re going to keep doing it,” she said. Both Koch and Morgan are part of NASA’s Astronaut Class of 2013, the first to have a 50-50 split between women and men. NASA announced the extended assignments this week. The primary reason for the schedule shuffling is to free up a seat on a pair of Russian Soyuz spacecraft for the United Arab Emirates’ first astronaut, Hazza al-Mansoori. He will spend just over a week in orbit this fall. Russia still holds the world’s space endurance record. A Russian cosmonaut-physician spent nearly 15 months on a single mission aboard the former Mir space station in the mid-1990s. National Cancer Chief Named as Acting Head of the F.D.A.